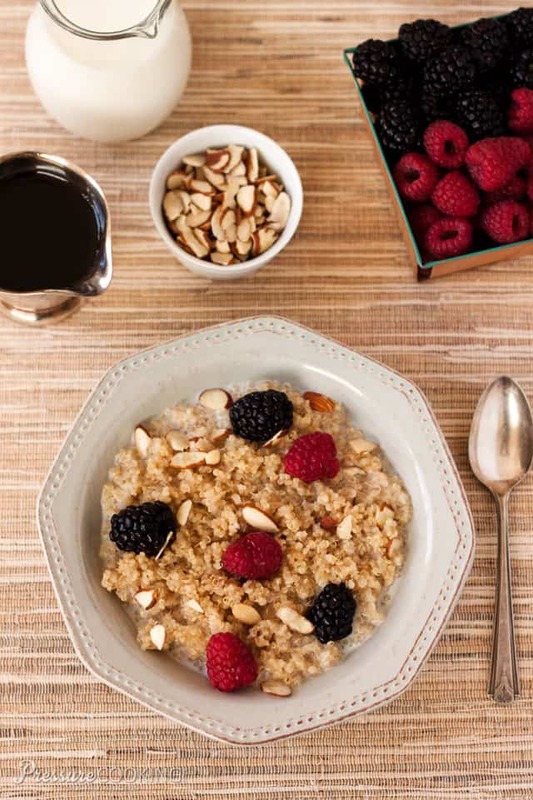 Light and fluffy maple cinnamon breakfast quinoa served with fresh berries and sliced almonds. Only a 1 minute cook time in the pressure cooker / Instant Pot. Put this Pressure Cooker Breakfast Quinoa on your menu this week. by JL Fields to review. JL also blogs at JL Goes Vegan and I featured her Portobello Mushroom and Barley Soup a couple of years ago on Pressure Cooking Today and today I’m featuring a recipe from her cookbook. I’m not vegan, and probably never will be, but I definitely need to add more vegetables, bean and grains to my diet, and this gorgeous cookbook has lots of great recipes to help me do that. An Instant Pot is one of the most popular brands of electric pressure cookers. 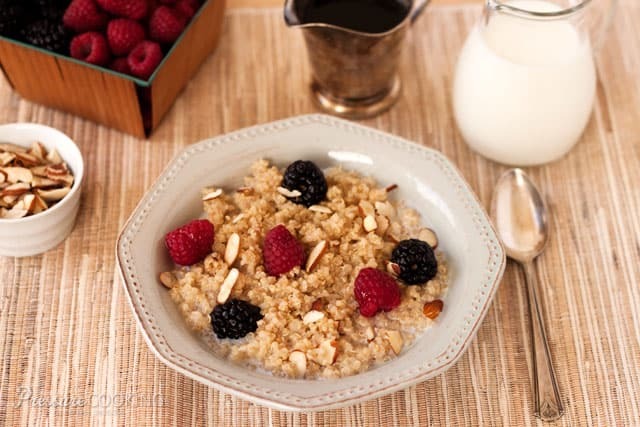 They are easy to use and your Instant Pot can help you create this delicious Breakfast Quinoa! I was attracted to JL’s basic quinoa recipe in the cookbook because quinoa cooks in 1 minute in the pressure cooker. After 1 minute, you turn the pressure cooker off and let the quinoa steam while the pressure releases for 10 minutes. Did you know that quinoa (pronounced keen-wah) is high in protein and fiber, is gluten-free, a complex carbohydrate with a low glycemic index, and only has 172 calories per 1/4 cup dry quinoa. JL suggests serving the quinoa warm for breakfast with a drizzle of maple syrup and chopped pecans. I added some cinnamon and maple to the cooking liquid and served it topped with berries and some sliced almonds I had on hand. I increased the recipe a little bit so I’d have plenty on hand to eat for breakfast throughout the week. It reheats well in the microwave and still keeps its light and fluffy texture. It will leave you feeling full all morning long. It’s a perfect, healthy way to start the day. Add quinoa, water, maple syrup, vanilla, cinnamon, and salt to the pressure cooking pot. Select high pressure and 1 minute cook time. When beep sounds turn pressure cooker off, wait 10 minutes, and then use a Quick Pressure Release to release any remaining pressure. Fluff the quinoa and serve hot with milk, berries, and sliced almonds. Disclosure: I was sent a free copy to review, but all opinions expressed are always my own. I love using a pressure cooker, but need to broaden my options as I tend to cook the same things over and over again. I have been using my mother’s pressure cooker that’s older than me and just recently got a new one, but I’m afraid to use it. I love my electric pressure cooker! I am always looking for new recipes. I found your site today and I am so excited to try out some of your recipes! And the vegan cookbook you are featuring looks awesome as well! Can’t wait to use my pressure cooker more often! Any idea if I add steel cut oats to quinoa how it will impact teh water and cooking time? I haven’t tried it, but you’d want to use a recipe for cooking steel cut oats and just sub some of the oats for quinoa. I am not a vegitarian or vegan but I value being able to cook great tasting food using all kinds of cooking. Need to know how to provide alternative ways of making healthy food with other types of protein. The book looks like it will have some great recipes in it. I recently purchased an electric pressure cooker (It was my Christmas gift). So I really could use more recipes. I’m not vegan but love everything that helps us to eat healthy foods and the pressure cooker is an awesome appliance to do that. Thank you for all your recipes that you post, I love quinoa also and the breakfast cereal made with it is delicious. This sounds good! Would love to see all the recipes! I love vegan pressure cooking! I have an old school pressure cooker that I never used. Looking into getting a new one and would love to have some recipes to inspire me. Thanks for the giveaway! I’ve recently received the electric Instapot and since that time have rediscovered pressure cooking. Thanks to websites such as pressurecookingtoday and others, I now use my pressure cooker every day for some part of a meal, whether it is the main course or side dish or dessert. I have had a regular pressure cooker for years, but never used it because of the time consuming part of watching it and trying to regulate the pressure. Now I am in love with pressure cooking all over again. Along with my goal to eat more healthy and less meats in 2015, I am excited to begin my pressure cooking year with healthy recipes! 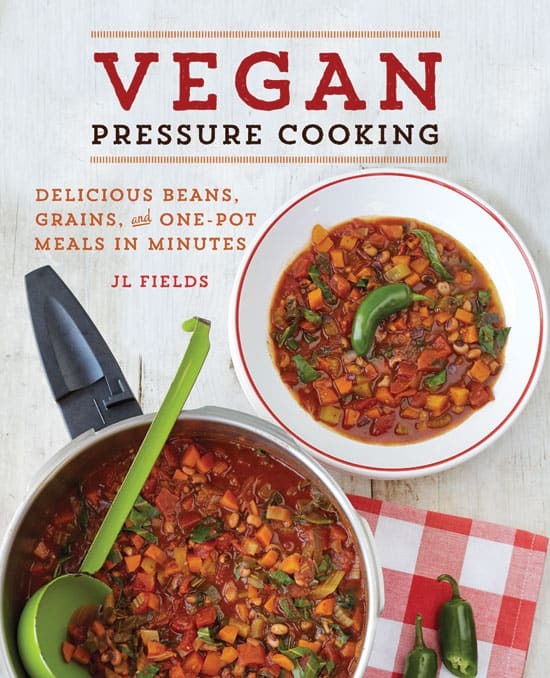 I’m the opposite of you – I’m already vegan, but looking to learn more about pressure cooking! I made Barbara’s bow tie pasta and sauce. It was delicious. Can’t wait to try this pressure cooker breakfast-quinoa. I love hot cereals for breakfast and this looks like it will be a welcoming change from the usual oatmeal. Since finding your website I use my cooker more than ever before. I love it. Thanks for all the great recipes. I’ve just received my new instant pot and am ready to start enjoying some wonderful recipes. Recipe looks great. Can’t wait to try it!